Registration for the Summer Session begins on Monday, April 29th for current students and Monday, May 6th for new students. Summer session dates are Monday, June 3rd through August 17th. This session is 11 weeks long, and we are excited for some summer fun! In addition to classes we are bringing back our Summer Fun Days. The Jump Spot will provide fun activities to get your kids out of the house and off the computer. Sign your kids up, and take a break. More details to post in the up coming weeks. Registration CANNOT be done online or over email. If you are interested in registering your child for a class you need to visit our front desk or call, 309-662-7768. We offer a variety of classes for boys and girls of all ages! Parents and their kids absolutely love the Jump Spot! Come check us out! We have many different classes for your family! All of our classes have a small student/teacher ratio, and we pride ourselves on knowing each child and their needs, and focusing on those needs. We have a warm relationship with the children and the children feel very comfortable with us! Parents love the fact that their children feel at home while at The Jump Spot. Our environment is perfect for those children who are overstimulated in a large facility, as we have one open area that is geared towards one class at a time. To sign your child up for our program, contact us and we will consult with you to find out the type of class your child wants, as well as what difficulty level suits him or her. Once we figure that out, we then schedule a starting date. If you would like to be added to a wait list for any of our classes this session, please call us and we can get you on the list! We often try to start an additional class if we have the space and at least three on the wait list! 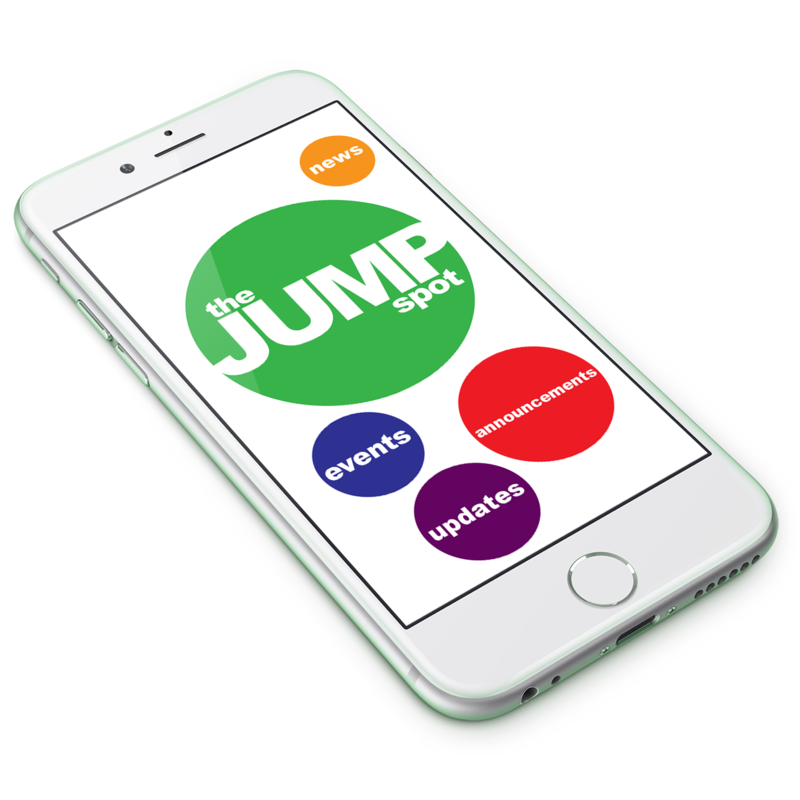 To stay up to date with what's happening at the Jump Spot, be sure to visit the website often. News about classes, sessions, events, etc. will be posted on the website! When we have urgent, time-sensitive announcements to share, we will post them in a red bar at the top of the website! We will close for business if the weather keeps the staff from coming into work. We will follow District 87 closings. Please check our voicemail, Facebook and website if the weather is questionable. We will NOT hold make up classes for closings due to Mother Nature. Parents and their kids absolutely love the Jump Spot! The Jump Spot has helped my daughter, who is 4 ½, become more open to new experiences. Since she has been a member at Jump Spot, it has improved not just her balance and coordination, but the way she loves to try new things. Jump Spot has given her that confidence! As a parent, I appreciate the sportsmanship that The Jump Spot instills in my children (a 5 year old and 2 year old). It teaches kids to be both a good winner and a good loser, and I think there’s so much value in that. I love watching them grow and gain that competitive but respectful nature. The Jump Spot is great at getting kids to interact with each other, as well as being a great place for kids to exercise. Brooke Lenahan has two children who participate in Jump Spot classes (a 4 ½ year old in the Frogs class and a 2 ½ year old in the Tadpoles class). Jump Spot is a great place for young kids to learn how to become active, follow directions, and incorporate fitness into their daily lives, all while still having fun. Ann has two children at Jump Spot, a 5-year old in the All-Stars and a 3-year-old in the Froglets. Both of my children love their classes! I love that the classes offer competitive activities, but still in a very safe environment. It lets them move around freely, but still in a controlled, safe way. I also appreciate the unique opportunity Jump Spot provides through classes, giving my children a chance to try different things, like in their gymnastics class, and still have a sort of 'safety net' in place. I like the personal way in which the staff interacts with me and my family. You’re not just another face when you come in here -- the staff is so welcoming. It’s so comforting, not just for us parents, but for the kids. Meet the Jump Spot Staff! Check out the “Our Staff” tab at the top of the page!